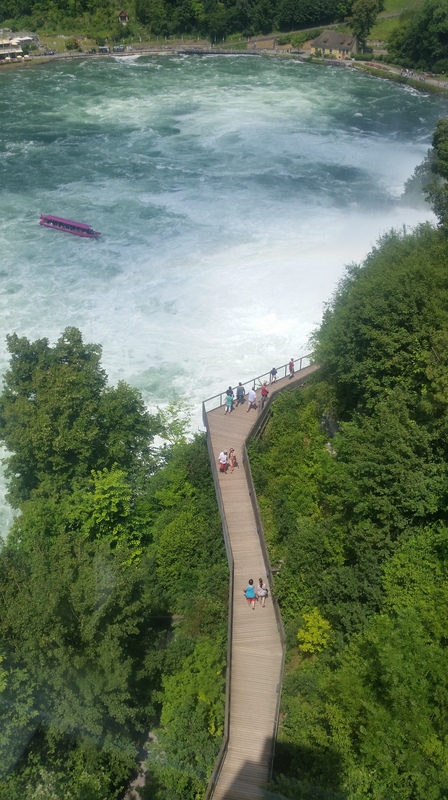 Welcome to Neuhausen am Rheinfall (Wikipedia) – we are visitng europe’s largest plain waterfall. Here’s the first view you get. 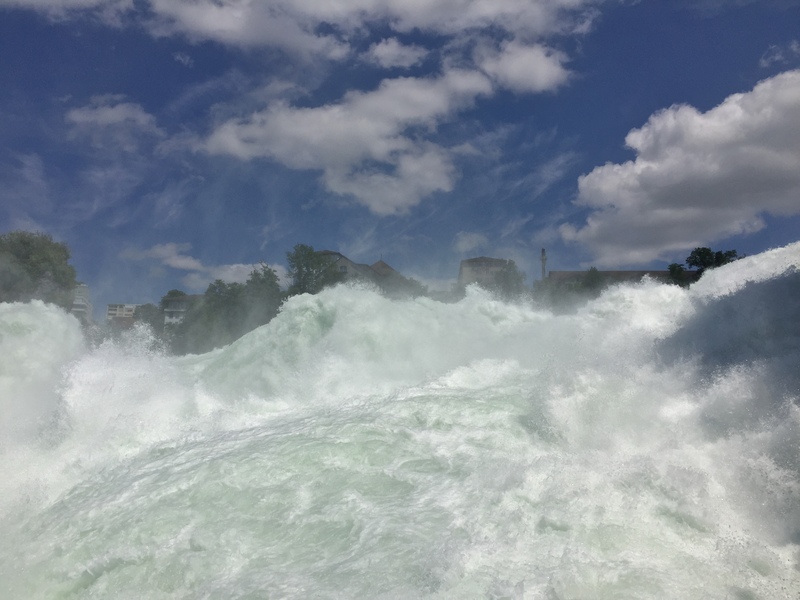 When arriving you see the Rhine Falls from the front. Well will walk to the castle at the right side – from there you go down by lift and will get very, very close to the water. You could even climb the stairs on the big rock in the middle, you get there by boat – but at the time we were there they would not get close to the rock because of too much water. 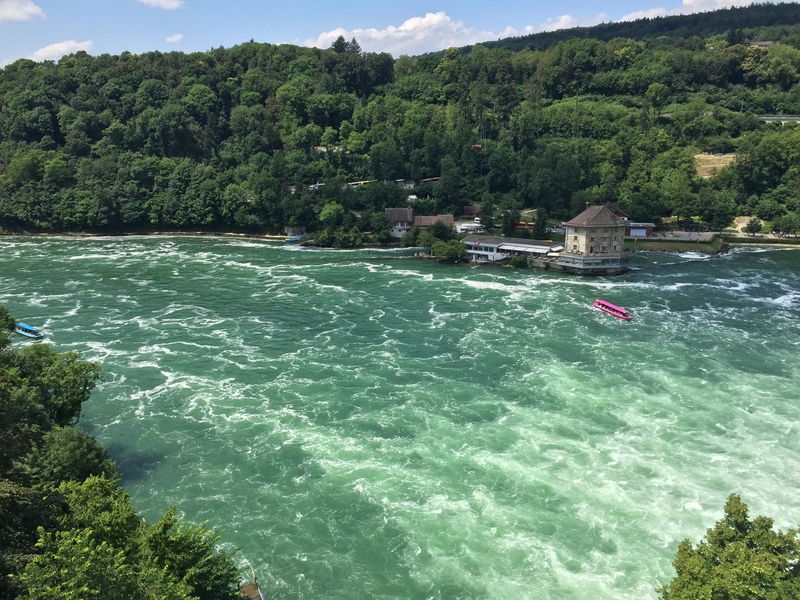 Here’s one of the boats that normally would get you as close as possible to the Rhine Falls – you would stand right in it. 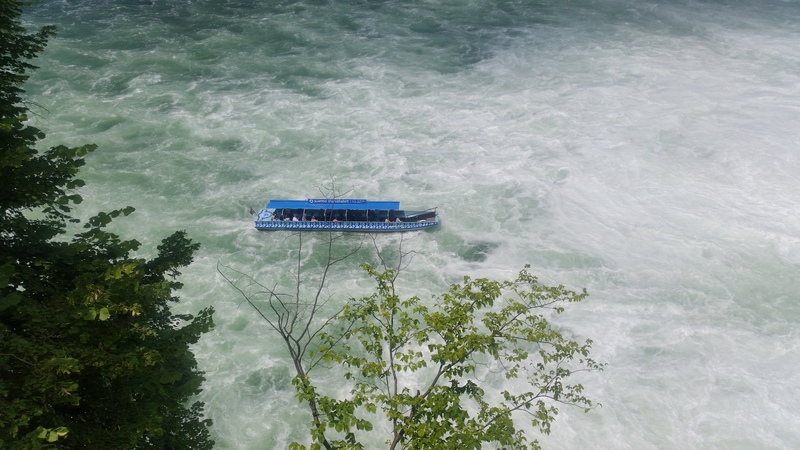 A tour boat gets closer to the falls. There are a lot of viewpoints where you can get close to the water and take images – those were well occupied so we continue our way around. It is always an incredible experience when you have the opportunity to explore natural wonders. Here’s a beautiful view at the Schloss Laufen. The castle – Schloss Laufen. This view is beautiful. All those stairs and the walk over the railroad bridge were worth it – we really did not know what to expect in the beginning. Those colors, what an amazing beauty. We are over the bridge and made it to the castle. From now on it will get louder and louder as we get closer and closer to the falls. From the castle we took the lift to get down to continue our way to the caves. There’s also the possibility to use the stairs. Very impressive view from the lift. 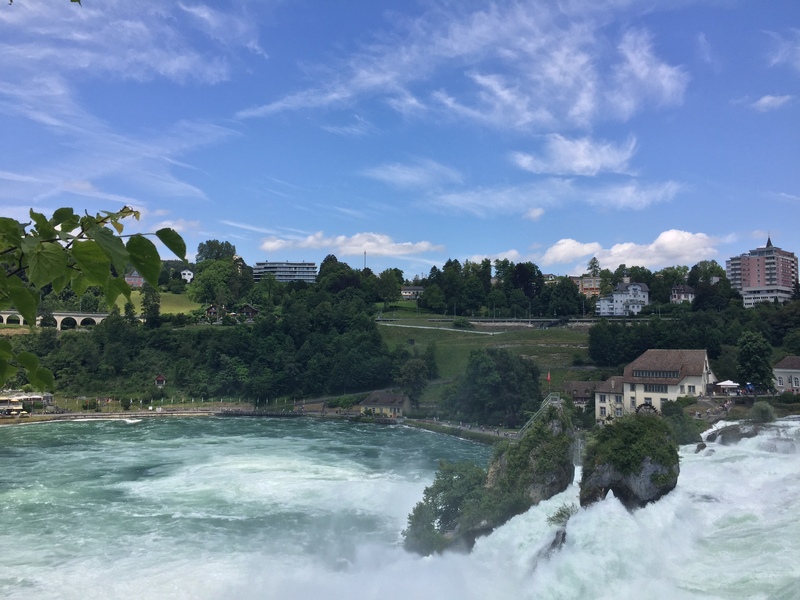 That’s the closest we could get to the Rhine Falls. You could almost reach out and touch it, that’s how close it felt. Feel the awesome energy and experience the drops of water on your skin. The noise, the motion… you just feel very humble. 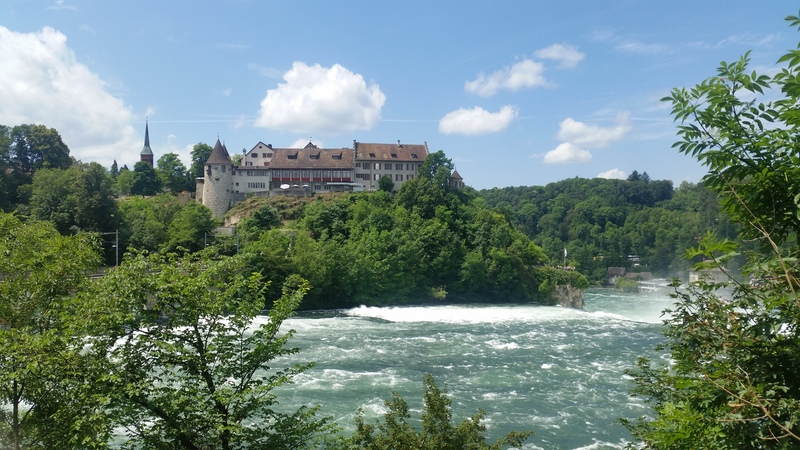 Panoramic view from the castle side at the Rhine Falls. Can you feel the mist, the water drops? 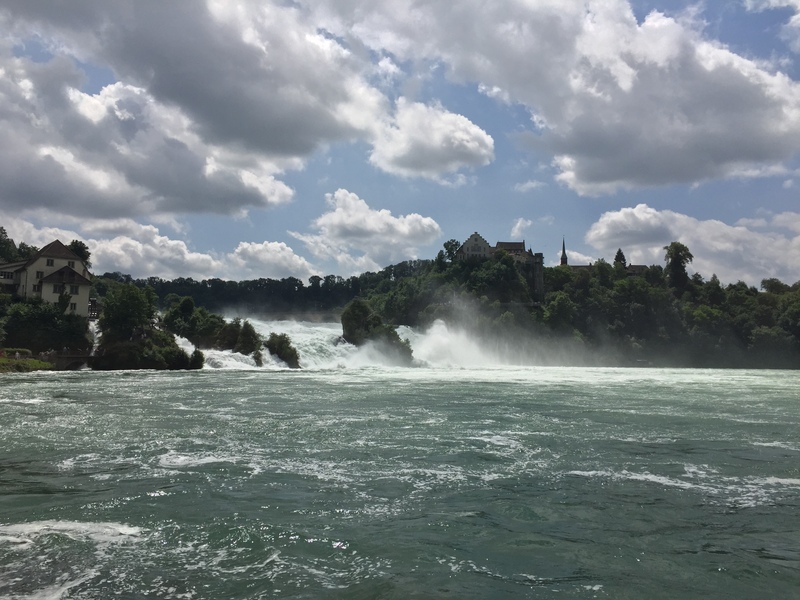 The walk took us about three hours, enough time to soak up all the energy from the Rhine Falls and some of the waterdrops. Even if it has been almost a year after our visit there, we still like to take a look at the pictures and talk about what we’ve seen and experienced. Very impressive view from the elevator. Wow! What a beauty indeed! We supposed to go there last year but unfortunately got lost somewhere on the German border of Switzerland haha! Thanks for your time checking my blog otherwise I wouldn’t know about your beautiful blog. Cheers!